Every year the A Woman’s View team and our amazing family of patients join forces to raise money for the March of Dimes March for Babies. This year, AWV is sponsoring the Clonch family and their baby girl, Morgan. 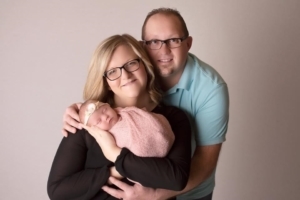 Morgan is a miracle baby after Thomas and Allison Clonch tried for 5 years to get pregnant. Morgan was originally 1 of 3, but unfortunately Thomas and Alison lost two of the babies early on in the pregnancy. They didn’t give up though! At 32 weeks and 4 days, Morgan was born on December 18, 2018 weighing 4lb 15 oz. She spent 3 weeks in the NICU and is now home with her mom and dad and a healthy, happy little girl. We are honored and excited to share their story of incredible strength in this year’s March for Babies. To register for the march, click here and search for A Woman’s View. Be sure to stop by our office and purchase raffle tickets for the chance to win one of our four amazing baskets. All basket photos and descriptors can be found on our Facebook page.